Waking from a fitful dream, he struggled out of bed and stumbled to a barred window. From this perspective in the asylum, he beheld a clear night, a large morning star enchanting him. The sight of stars always inspired him. Just as we take a train from Paris to Amsterdam, he thought, we take death to go to a star. About a year later, he died from a self-inflicted gunshot wound to the chest. He was 37 years old. Life started more hopefully for him. He was son of a country minister who valued education. He memorized more than three-fourths of the Bible. As a young man, he lived in Paris and worked for his uncle who was a successful art dealer. He learned and mastered four languages. He also fell deeply in love with his landlady’s daughter, who rejected him in favor of another. This rejection devastated him and led to his being fired from his uncle’s gallery. Church leaders did not see him as an asset but rather as undignified, so they fired him. Again, he sought refuge in his family and even became captivated by his widowed cousin, Kate. He declared his love for her, which Kate and her parents found repulsive. Finally, he decided to dedicate the rest of his life to pursuing art. His younger brother saw potential in his paintings and agreed to support him with a monthly stipend. An art dealer, his brother believed the older brother’s paintings might sell in Paris. During the next ten years, he moved around Europe while befriending artist peers. He started an artist’s union in a town near Paris where notable artists visited and painted with him. The stipend his brother, Theo, gave him was adequate for living expenses but not for models, canvases, and expensive oil paints. He often lived solely on coffee, cigarettes, bread, and the psychedelic liqueur absinthe. He had a habit of putting his paintbrushes in his mouth, exposing him to lead poisoning. He also sipped turpentine from time to time. These horrible health practices and the hallucinogenic effects of absinthe contributed to occasional spells of madness and thus the asylum that I described at the beginning of this story. During ten years of prodigious output, he created over 2,100 paintings. Yet he did not gain the favor of rich art collectors. People in the town where he lived treated him viciously and even signed a petition asking government officials for his removal. During this decade of frenetic work, his younger brother was only able to sell a single painting for the equivalent of $2,300 today. Vincent van Gogh, who preferred to sign his paintings with just Vincent, felt despondent, lonely, and rejected for most of his adult life. He shot himself in the chest as a final act of self-loathing, although he did not successfully kill himself outright. He died two days later in the arms of his devoted brother, Theo. Today, we view Vincent as one of the greatest artists of the twentieth century. The 1889 painting inspired by the clear night while he was in an asylum became known as “The Starry Night” and is housed at the Museum of Modern Art in New York. His painting called “Irises” sold for $54 million dollars at auction. Another painting, a portrait of a doctor who cared for him in the asylum, sold for $83 million dollars. Vincent’s story can be a lesson for all of us. He went to his grave seeing himself as a loser. He felt unloved, misunderstood, and rejected by all but his younger brother. Most of us experience some of the pain that followed Vincent through his life. Maybe we fail to achieve our most private dream. Or we lose in love. Or we feel misunderstood. These feelings are part of the human experience. Vincent’s story teaches us that in the end we may never know the full scope of our impact on the world. Our total influence may emerge after we are gone. 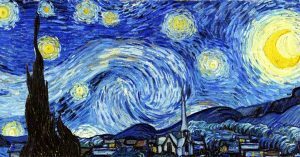 Next time things don’t work out, remember Vincent, an asylum and a painting called “The Starry Night.” It is a priceless masterpiece and one enduring legacy of a downtrodden and defeated man who created the work.